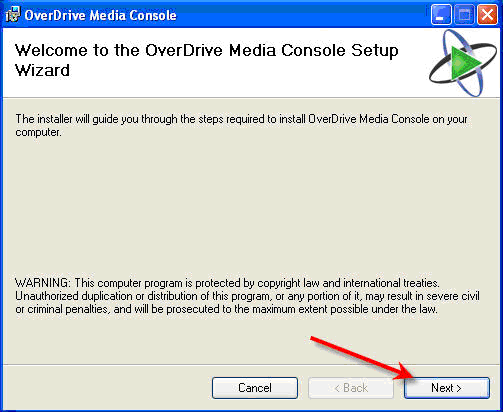 You must install the OverDrive Media Console for Windows software prior to downloading your first WMA audiobook. 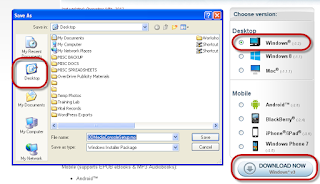 This free software manages your audiobook downloads and allows the WMA audiobooks to be opened and enjoyed on your PC and ultimately transferred to your Apple device or other compatible player. 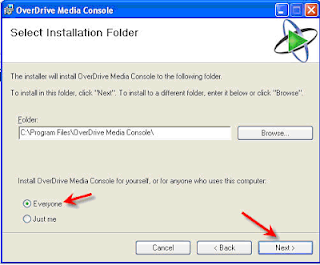 Click on "Help" to find the software downloads. From the "Help" page, click on "Software." 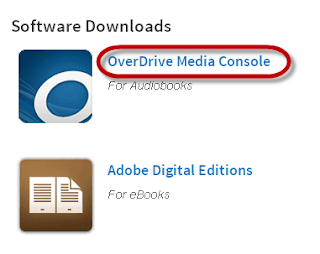 A new tab or window opens to the OverDrive Media Console page. 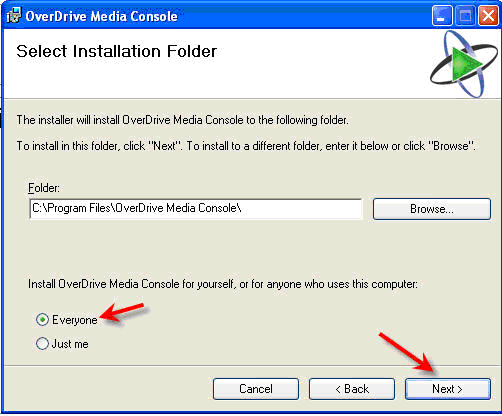 Click “Download Now” download the installer. 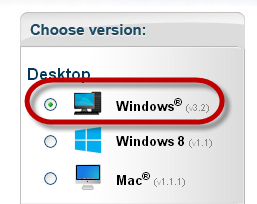 Note: The browser you choose to use handles the installation differently. Firefox users: Check your preferred download location to find the installer and double-click the file to start the installation. 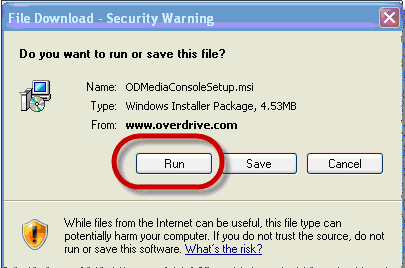 Internet Explorer users: Chose to “Run” the file. Chrome Users: Look for a small download box in the lower-left corner of your browser. Click to run the download. Be aware that you might receive a security warning, depending on your operating system’s security settings. 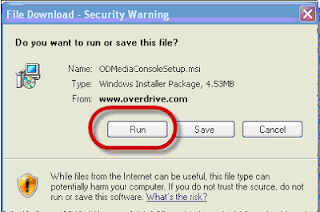 Click “Run” to start the installation. Be sure to agree to the licensing agreement. 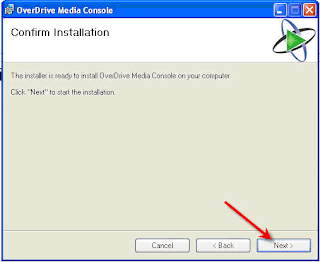 Install the software in the default location unless you have a very good reason to change it. 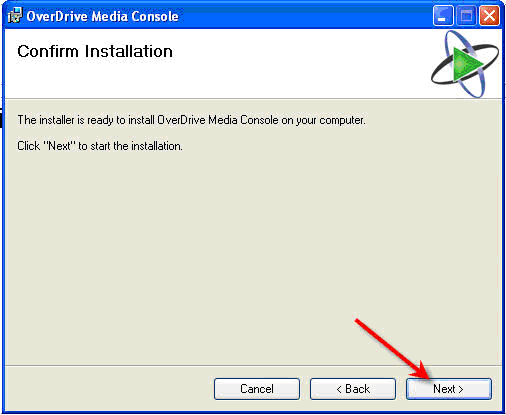 Close the installation wizard when prompted to do so. 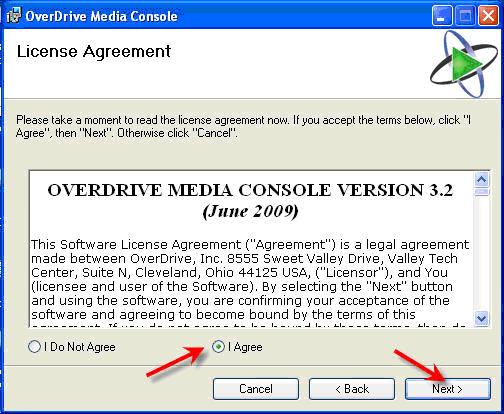 At this point, the OverDrive Media Console software has been installed. 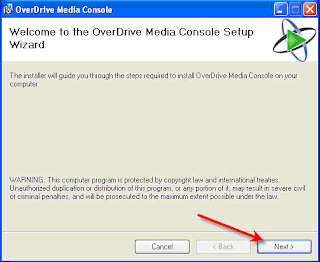 However, you must still perform a Windows Media Player Security Upgrade to download WMA audiobooks to your Windows computer. The Surface Tablet running Windows RT cannot play WMA audiobooks and does not need the WMP Security Upgrade. 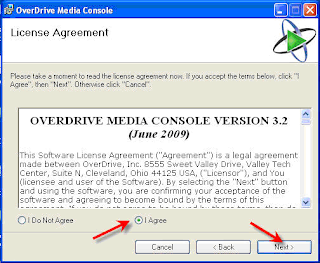 The Windows Media Player Security Upgrade cannot be performed on a Mac computer. 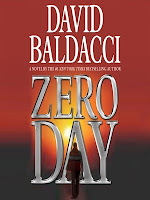 Mac computers cannot download WMA Audiobooks. The OMC mobile app cannot download WMA Audiobooks. 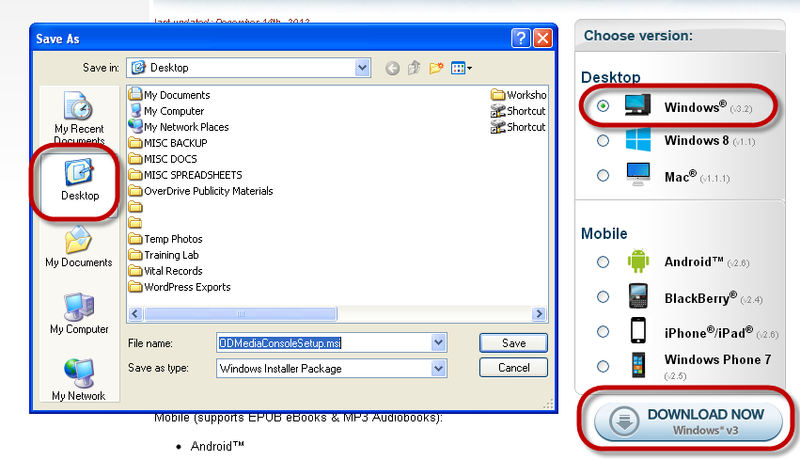 MP3 Audiobooks can also be downloaded to a Mac and transferred to an Apple device.